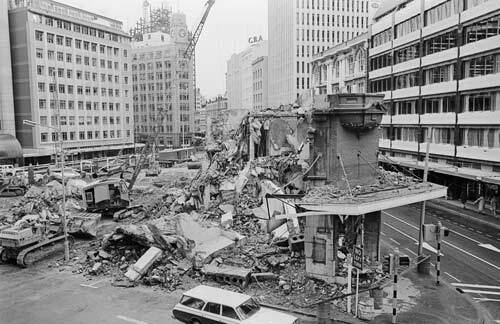 A demolition crane makes short work of the last wall of the old ANZ bank in Lambton Quay in 1980. Wellington’s growing service sector in the 1970s increased the demand for city office space. Combined with stricter earthquake building codes this led to a construction boom. Steel and glass skyscrapers replaced ornate but vulnerable masonry buildings. Activity increased after the government deregulated the financial markets in 1984. Investors poured money into office buildings, which seemingly rose overnight on the city’s skyline. The boom ended when the stock market crashed in 1987.